Repaving your Asphalt Driveway has a huge impact on the look and curb appeal of your home. Shiny blacktop creates that clean warm appearance that Illinois homeowners have come to love. 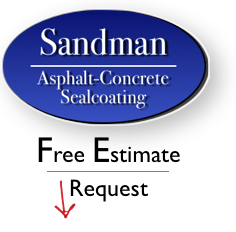 Our team here at Sandman’s Asphalt Paving have been paving driveways for many, many years and are committed to providing a great product at a great price. We have numerous cost effective options for your driveway paving. Seal coating- This works best for driveways that are in good shape but have minor cracks and fading. This process will make your surface look great, keep moisture out and extend the life of your asphalt. Patching- This service takes care of potholes, large cracks, and sunken areas. This is a great option to treat these problems. We’ll simply cut out the problem areas, repair the base layer and repave with fresh asphalt. Overlay- aka driveway re-paving. If the base layer of your driveway is in good shape, we can simply lay a new layer of asphalt down which will look and function great. Driveway replacement- If your driveway suffers from a poor base layer, major heaving, or major drainage issues, we can do a full driveway and base layer replacement at some of the best prices around! Driveway repair is very common here in Illinois. Our weather is extreme with our cold winters and warm summers. This is rough on asphalt. The most common problems that we see are sunken areas around the garage entry point, crumbling asphalt edges, heaving and cracking. We can definitely help you here. Give us a call or fill in your information in the form to your right and we’ll get out to do your free estimate. After completion, our experienced asphalt contractors will even give you some tips and a maintenance plan to save you money and extend the life of your surface.